It's time to go back to work. Today I found myself at Stuttgart Hbf waiting for the Intercity to Switzerland. I was early, so I had some time to look around my platform at the castrated main station. 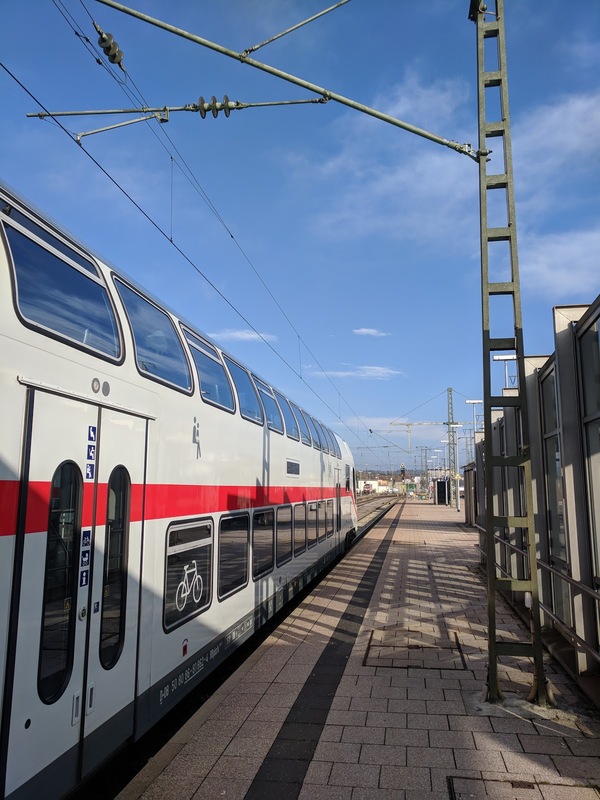 Deutsche Bahn is investing heavily into new rolling stock and locomotives. In the last couple years there's always some new kind of locomotive I haven't seen yet. Here's one of 20 DB Regio class 147 locomotives, a particularly ugly member of Bombardier's Traxx3 family. 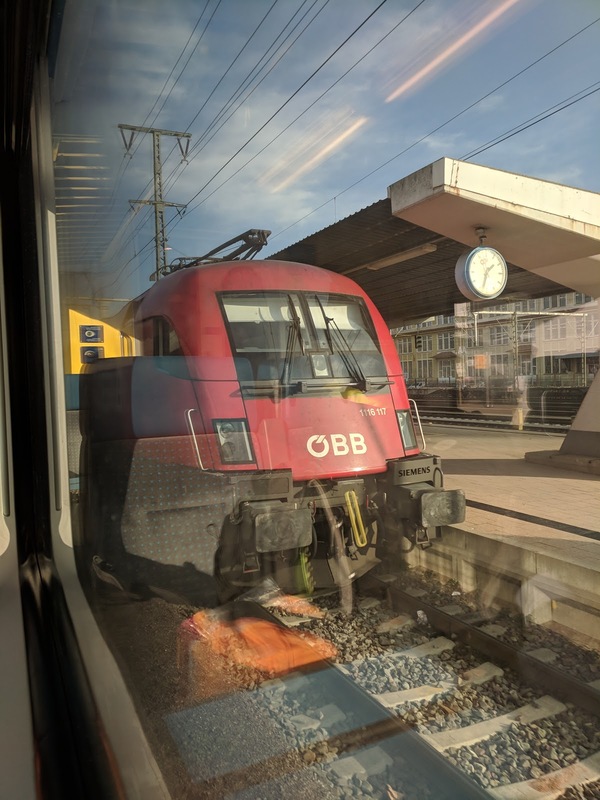 Amusingly, it was leading a Regional Express to Heilbronn formed from 40 year-old refurbished Silver Coin ("Silberlinge") cars. The InterCity arrived right on time. As scheduled it's a new IC2 train set. These trains are unusual in that they look like a regular train with 5 cars and a locomotive, but operate only as a unit. I have a separate post on this trainset. En-route, at the railroad museum in Rottweil, I saw this unusual version of the Uerdinger railbus, equipped with magnetic brakes for operation on very steep lines that require independent braking systems. Arrival in Singen. I need to change trains. 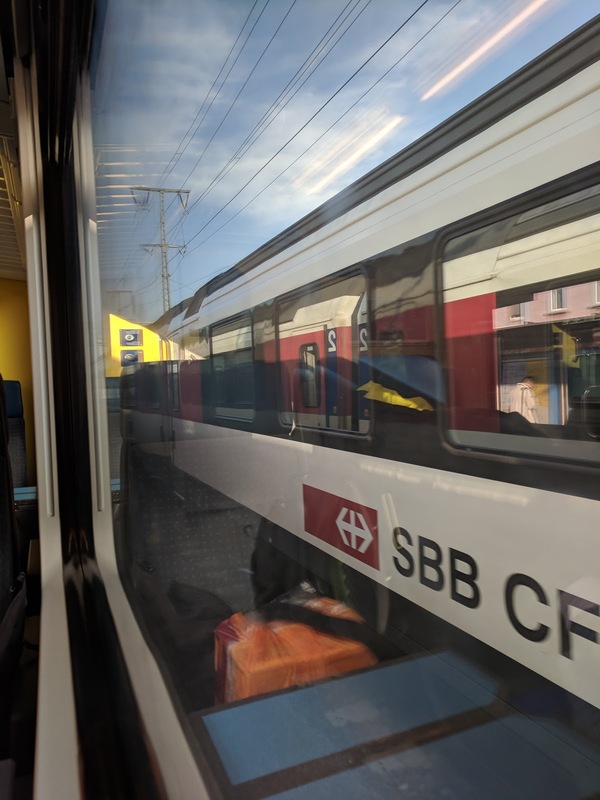 The new IC2 train sets are not yet allowed to enter Switzerland, due to delays in getting the appropriate train safety system delivered and approved. 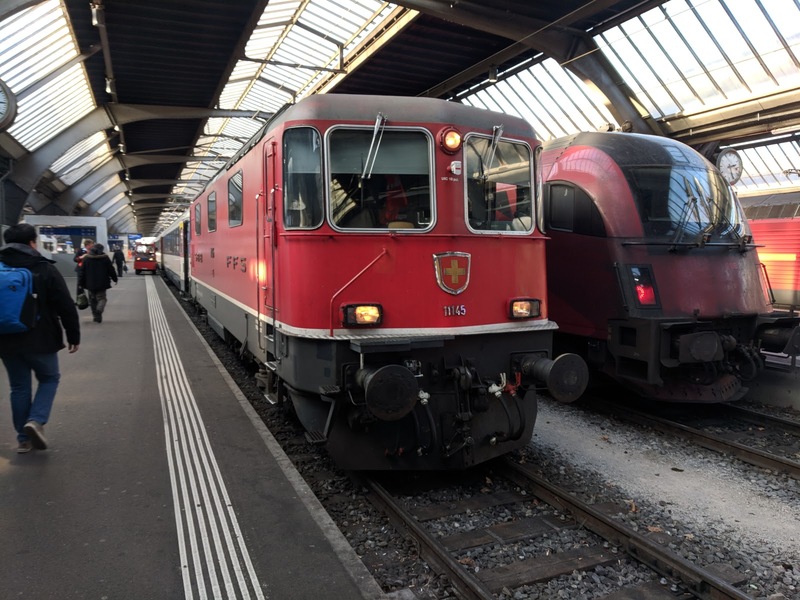 IC 485 to Zurich consists of the older SBB Intercity cars that have taken me from Stuttgart to Zurich and back for the last few years. After taking photos, I settle down in my seat and wait for the departure. The opposing Intercity from Zurich arrives on the neighboring track, as usual pulled by a trusty swiss Re 4/4 II. The Intercity changes direction and locomotives in Singen. I wonder what kind of locomotive will be leading that train to Stuttgart. To my utter surprise that train continues it's journey with an Austrian OeBB Taurus. Hmmm, does DB not have enough locomotives after all? The Rheinfall was quite impressive today, but the sun shone directly on the window, so the photo turned out to be only mediocre. 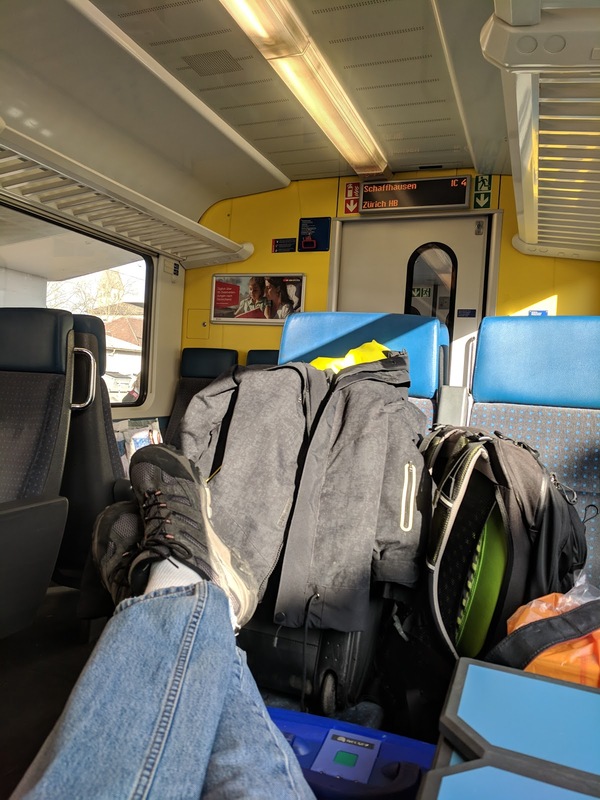 I successfully made it to Zurich HB 45 minutes later. Here's Re 4/4 II 11145, next to the RailJet to Vienna. A short tram ride later I'm at my temporary home for the next two weeks. das letzte Foto sieht gemütlich aus. 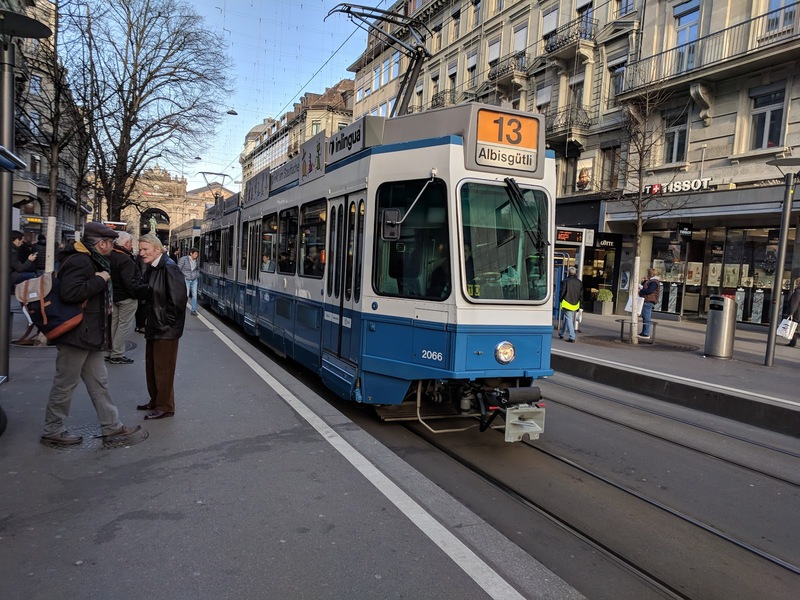 Viel Erfolg in Zürich! das letzte Foto sieht gemütlich aus. Ja, ich mag die aelteren Trams, auch wenn die neuen Zuege Niederflur und mit Koffern deutlich einfacher zu handhaben sind.